Two real guys. They play with their muscles, macho, relaxed and totally cool. They come from the street so it’s breakdance, innit? 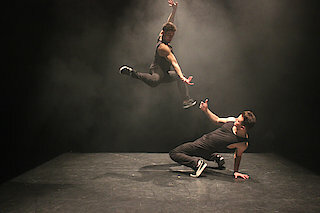 But in this case it’s not just B-Boying, but a precisely worked-out balancing act between hip-hop and contemporary dance. Expressive forms from both genres are mixed unconventionally and dramatised with great effect. Originally created by Tony Mills and Matt Foster for David Hughes Dance Productions, the show has now been further developed by Tony Mills and adapted for new dancers. Questions related to identity, strength and vulnerability are thrown up in a dynamic and humorous way.